Your fuel tank is not equipped with a fuel fill cap. You can insert the filler nozzle directly into the filler neck. The tank seals itself again when you pull out the filler nozzle. 3. 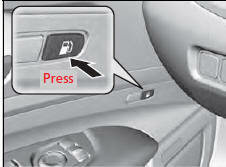 Press the fuel fill door release button. - The fuel fill door opens. 4. Place the end of the filler nozzle on the lower part of filler opening, then insert it slowly and fully. - Make sure that the end of the filler nozzle goes down along with the filler pipe. - Keep the filler nozzle level. - When the tank is full, the filler nozzle will click off automatically. - After filling, wait about five seconds before removing the filler nozzle. 5. Shut the fuel fill door by hand. Only a service station filler nozzle can be used. If the fuel nozzle keeps turning off when the tank is not full, there may be a problem with the pump’s fuel vapor recovery system. Try filling at another pump. If this does not fix the problem, consult a dealer.